Budding advocates from The City Law School triumph in the national Inter-BPTC Moot Competition. 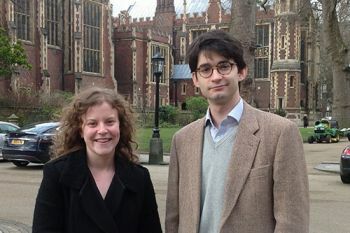 Bar Professional Training Course (BPTC) students Michael Levenstein and Jodie Drummond from The City Law School, won the coveted IPMC Shield by defeating their counterparts from Cardiff Law School, in the final round of the national Inter-BPTC Moot Competition, held on 21st February at Lincoln's Inn. Competitors were selected on the basis of a preliminary moot competition held late last year, in which the highest scorers represented their schools. The mooting question was heard before a mock Court of Appeal and involved what remedies should follow from a commercial contractual dispute, namely, should a party who deliberately breaches his obligations to make a larger profit with a third party be liable to disgorge his ill-gotten profits to an aggrieved claimant? Michael and Jodie successfully appealed that a claimant should be able to recover both the cost of reinstatement and/or account of profits where a deliberate breach in a construction contract occurred by a specialist renovator. This recent success underscores the considerable prowess of students in The City Law School in national and international mooting competitions. Last month three BPTC students won the prize for Best University/Law School team at a competition run by the Worshipful Company of Arbitrators. The Court of Appeal which is divided into Civil and Criminal Divisions, and which sits in up to a dozen courts in the Royal Courts of Justice, hears appeals from the Chancery, Queen's Bench and Family divisions of the High Court, from the County Courts across England & Wales from certain Tribunals and hears appeals from the Crown Court.